This large map describes the historic and existing railroads since 1862 that contributed to Oregon’s growth and the livelihood of its citizens. This display is annotated with narrative, pointing out places, events, transported commodities and persons of interest which tell the historic story of Oregon’s railroads. This new exhibit highlights in words, maps and photographs the important history of the Brooklyn Rail Yard. The exhibit showcases the early years of the Car Shops of the Oregon & California in the 1870s, the Southern Pacific’s principal shop facilities in Oregon in the 1940s, and the Union Pacific Railroad re-purposing the facility into an important intermodal facility serving Oregon and southwest Washington. The yard once boasted a 12-stall roundhouse. A 4-stall roundhouse “annex” was added, that later hosted the ongoing restoration of Portland’s three historic steam locomotives , SP 4449, SP&S 700 and OR&N 197. Visitors will learn the history of the rail yard, the types of activities which took place there, and the variety of locomotives and rolling stock which called the yard home over the years. The Oregon Historical Society’s wonderful exhibit All Aboard! Railroading and Portland’s Black Community appeared at the Oregon Rail Heritage Center. This remarkable exhibit showed through pictures and stories how the Black Community in Portland was built around the railroads. As late as 1941, the railroads provided 98.6% of all local black jobs. 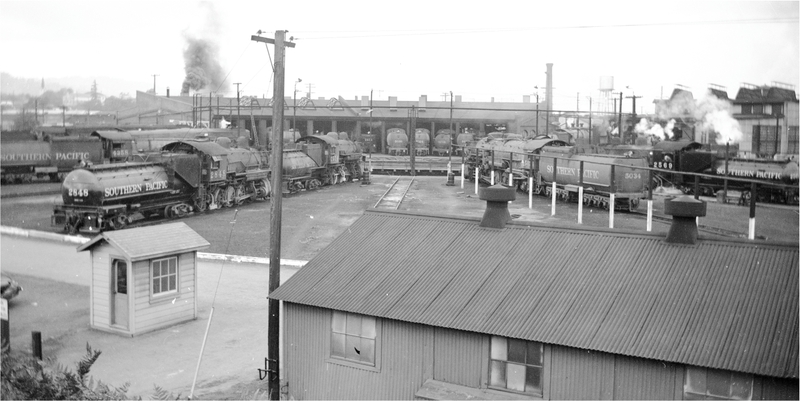 The Oregon Rail Heritage Center is open from 1 to 5 Thursdays through Sundays at 2250 SE Water Avenue near OMSI. Admission is free. Donations to support the Center and the exhibit gladly accepted. While you’re in the building take time to admire some of Portland’s most prized possessions — their steam engines and other railroad memorabilia.